The Intergovernmental Panel on Climate Change is a huge and yet very small organization. Thousands of scientists from all over the world contribute to the work of the IPCC on a voluntary basis as authors, contributors and reviewers. None of them is paid by the IPCC. The work of the IPCC is guided by a set of principles and procedures. The Panel takes major decisions at Plenary Sessions of government representatives. A central IPCC Secretariat supports the work of the IPCC. The IPCC is currently organized in 3 Working Groups and a Task Force. They are assisted by Technical Support Units (TSUs), which are hosted and financially supported by the government of the developed country Co-Chair of that Working Group/Task Force. A TSU may also be established to support the IPCC Chair in preparing the Synthesis Report for an assessment report. Working Group I deals with "The Physical Science Basis of Climate Change", Working Group II with "Climate Change Impacts, Adaptation and Vulnerability" and Working Group III with "Mitigation of Climate Change". Working Groups meet in Plenary session at the level of government representatives. The main objective of the Task Force on National Greenhouse Gas Inventories is to develop and refine a methodology for the calculation and reporting of national greenhouse gas emissions and removals. Besides the Working Groups and Task Force, further Task Groups and Steering Groups may be established for a limited or longer duration to consider a specific topic or question. One example is the Task Group on Data and Scenario Support for Impact and Climate Analysis (TGICA). In 2010 the IPCC Chair and the Secretary-General of the UN asked the InterAcademy Council (IAC) to carry out a review of the IPCC's processes and procedures. The IPCC responded to the recommendations made in the IAC report with a number of changes in its governance structure and procedures, agreed at the 32nd, 33rd, 34th and 35th Sessions. For more information on this process and its results, see Review of Processes and Procedures. the approval, adoption and acceptance of reports. Each IPCC Member country has a Focal Point which has been identified by the relevant authorities in the country. IPCC Focal Points prepare and update the list of national experts to help implement the IPCC work programme. The Focal Points also arrange for the provision of integrated comments on the accuracy and completeness of the scientific and/or technical content and the overall scientific and/or technical balance of drafts of reports. In cases where no Focal Point has been identified, all correspondence is directed to the Ministry of Foreign Affairs. For the list of IPCC Focal Points, please see here. The IPCC Bureau comprises the IPCC Chair, the IPCC Vice-Chairs, the Co-Chairs and Vice-Chairs of the Working Groups and the Co-Chairs of the Task Force. The IPCC Bureau is chaired by the IPCC Chair. There are currently 34 members. During its 41st Session , the Panel decided to increase the size of the Bureau to 34 members through an increase in representation from Africa (2) and Asia (1). The Task Force on National Greenhouse Gas Inventories (TFI) has its own Task Force Bureau (TFB) composed of 12 members and the 2 Co-Chairs of the TFI. The TFB overseas the National Greenhouse Gas Inventories Programme. The current TFB was elected in October 2015 according to the procedures in Appendix C to the Principles Governing IPCC Work - Rules of Procedures for the Election of the IPCC Bureau and any Task Force Bureau. The term of the TFB is normally the same as the term of the IPCC Bureau, and its members are elected at the same Session at which the IPCC Bureau is elected, unless decided otherwise by the Panel. In response to recommendations made by the IAC, the Panel decided to establish an Executive Committee to strengthen and facilitate timely and effective implementation of the IPCC programme of work, strengthen coordination between Working Groups and Task Forces and to address urgent issues that require prompt attention by the IPCC between Panel sessions. Terms of reference, composition and mode of operation of the Executive Committee are described here. Hundreds of experts are involved on a voluntary basis in the preparation of IPCC reports. Coordinating Lead Authors and Lead Authors for IPCC reports are selected by the relevant Working Group/Task Force Bureau, under general guidance provided by the Session of the Working Group (or by the Panel in case of reports prepared by the Task Force on National Greenhouse Gas Inventories) from among experts listed by governments and participating organizations, and other experts known through their publications and works. None of them is paid by the IPCC. The composition of the group of Coordinating Lead Authors (CLAs) and Lead Authors (LAs) for a chapter, a report or its summary aims to reflect a range of scientific, technical and socio-economic views and expertise; geographical representation; a mixture of experts with and without previous experience in IPCC; and gender balance. The CLAs coordinate the content of the chapter they are responsible for. There are usually two CLAs per chapter, one from a developing country and one from a developed one. The LAs work in teams to produce the content of the chapter on the basis of the best scientific, technical and socio-economic information available. In the course of the assessment process Lead Authors may also enlist Contributing Authors. Contributing Authors provide Lead Authors more technical information on specific subjects covered by the chapter. The role of Review Editors in the IPCC assessment process is to assist the Working Group/Task Force Bureaux in identifying reviewers for the expert review process, ensure that all substantive expert and government review comments are afforded appropriate consideration by the author teams, advise Lead Authors on how to handle contentious/controversial issues and ensure genuine controversies are reflected adequately in the text of the report. There will be two to four Review Editors per chapter (including their executive summaries) and per technical summary of any IPCC assessment report. Expert reviewers review an IPCC draft report either by invitation or at their own request. Their role is to comment on the accuracy and completeness of the scientific, technical or socio-economic contents and the overall scientific, technical or social economic balance of draft reports. IPCC reports undergo a multi-stage review process. During the first review, First Order Drafts are widely circulated to independent experts all over the world that have significant expertise and/or publications in particular areas of the report, and to experts nominated earlier by governments and participating organizations. Those not selected to serve as a Lead Author or Review Editor for a given report traditionally serve as an expert reviewer for the particular report. During the second review by government and experts, Second Order Drafts and a first draft of the Summary for Policymakers will be distributed through the government focal points to all governments, all authors, reviewers involved in the previous expert review and further experts registering for the review. Thousands of scientists from all over the world participate in the IPCC review process as an expert reviewer. For more details see Principles and Procedures. Observer organizations have the opportunity of involving their experts in the expert review stages. Such experts provide reviews in their own name; they do not represent these observer organizations. 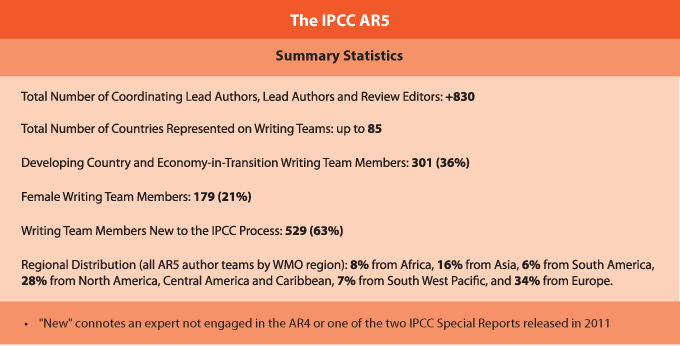 About 830 Authors and Review Editors from over 80 countries were selected to form the Author teams that produced the Fifth Assessment Report (AR5).They in turn drew on the work of over 1,000 Contributing Authors and about 2,000 expert reviewers who provided over 140,000 review comments. See the complete list of AR5 Authors and Review Editors. For statistics and regional coverage among the author teams click here. For the Fourth Assessment Report (AR4) released in 2007, over 3,500 experts coming from more than 130 countries contributed to the report (+450 Lead Authors, +800 Contributing Authors, and +2,500 expert reviewers providing over 90,000 review comments).